Like Water At A Buffet is the title of Martin Creed’s current exhibition at the Kappatos Gallery Art Residency program in Athens, Greece. The British artist was invited to stay for nearly a month to explore Greek culture, and present his response with a solo show. Spanning the gallery, Creed’s works incorporate an assemblage of paintings, graffiti, video installation, a neon sign, and sculpture. Situated on the second floor of a building block in central Athens, the gallery has vistas of the neighbouring dense urban settings, encompassing the streets and local shops that seemingly stimulated the artist’s inspiration from around the city. Upon entering the gallery, I was struck by déjà vu. Wall paintings in the space reminded me of the eggs thrown at Tate Gallery’s walls by a visitor back in 2001 in protest of Creed’s winning minimalist submission for the Turner Prize, Work No 227: The lights going on and off. Not quite the case this time—rather, I was tricked, yet still intrigued by the footprints and other naïve-styled drawings that were scattered on the gallery walls, the majority of which were the products of a live performance held during the exhibition’s opening. Creed instructed three female dancers wearing costumes that he designed himself (and are henceforth displayed on mannequins) to conduct a series of kinetic movements. 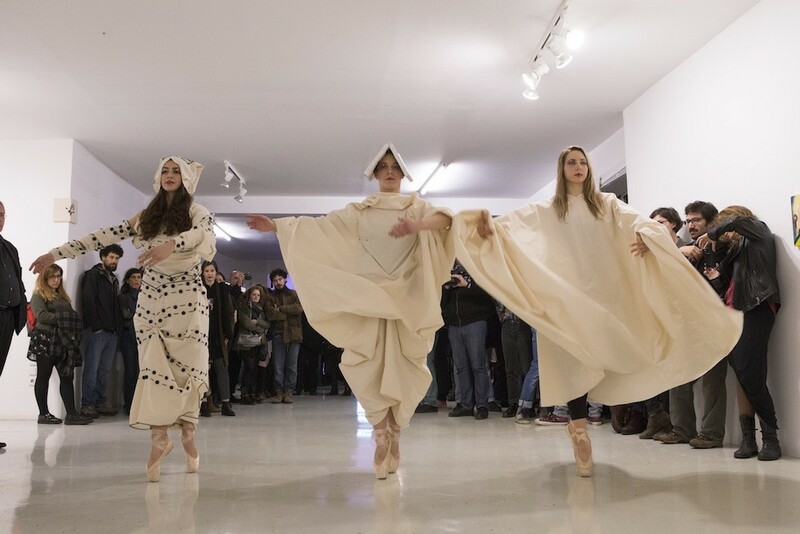 Departing from the traditional ballet vocabulary, the dancers performed an unorthodox motion routine where abstract drawings emerged by paintbrushes attached to their toes. We are informed by the show’s accompanying literature that this alternative choreography was based on Creed’s own lyrics “One step forwards, Two steps backwards, Laugh once, Cry twice”. Creed is well known for his song writing. In 2011, he launched his own record label, Telephone Records, where he released his single Thinking/Not Thinking the same year (followed by more at a later time), which he sang recently during a coinciding talk at the Athens School of Fine Arts. There, in place of hosting a lecture, in the traditional meaning of the word, he engaged with his audience through a performance of music and poetry. 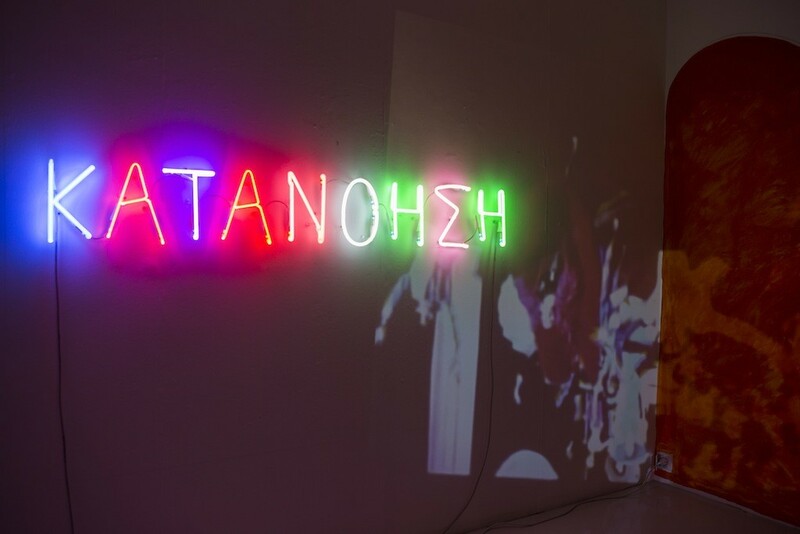 During his residency, Creed, amongst other activities, developed an interest in movies produced by the Greek film industry of the 1960s where he, unavoidably, found inspiration for the video installation (Work No 2212 Athens Film), of music and prose presented on the opening of his show. A series of small paintings render celebrated Greek personalities such as Demis Roussos and Maria Callas, whose portraits are created without the artist previously seeing them and are executed purely after an oral descriptive process regulated by a colleague. Evocative of forensic art practices embracing facial composites and facial approximation that reproduce an eyewitness’s memory, this piece presents a riveting concept that could potentially stand as a separate body of work interweaved with a performative element. A striking presence of graffiti in black paint invasively spreads between the surface of a window and the nearby wall, reading “WATER”. Perhaps extracted from his lyrics, yet also reminiscent of protest graffiti slogans sprayed around the streets of central Athens, Creed attempts to capture the crux of socio-economic malfunction and cultural breakdown of a country undergoing a major multifaceted crisis. 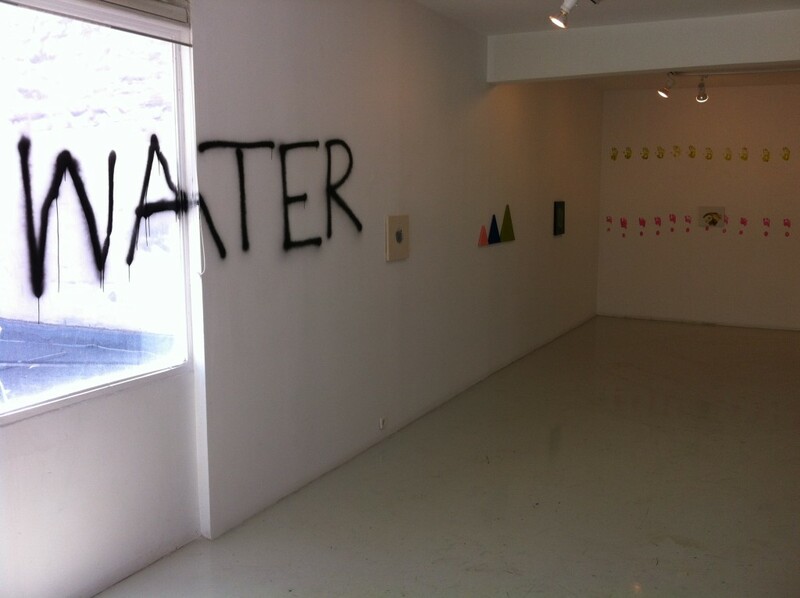 Although, admittedly, water is the only commodity not being included in a Greek’s protest repertoire, the artist probably senses the essence of the general political consensus of the country he is visiting and the uniqueness of the audience he is dealing with. On another wall, Creed’s colourful neon piece advertises “ΚΑΤΑΝΟΗΣΗ”, a term that can be interpreted as understanding and comprehension, but also as empathy; an emotionally charged word implying someone’s capacity and aptitude to fathom what the other is experiencing on a corporeal and spiritual level. Is this word compressing the moral of Creed’s Athenian narrative, or is it a reflection of anxiety and disquietude manifesting the artist’s discomfort towards an enchanting non-existent dreamland? The Kappatos residency programme (and all projects alike) succeeds in merging together artistic practices and personalities from diverse cultural and socio-economical backgrounds— challenge these forces in a collision of narratives and meaningful esoteric explorations. Giving international artists the opportunity to investigate new territories, while concurrently providing local audiences with thought provoking artistic practices, generates a subliminal exchange of ideas, emotions and reactions. It is a complex recipe that is hard to accomplish, but it can prove extremely useful and resourceful when all of these components are assembled in right proportions. 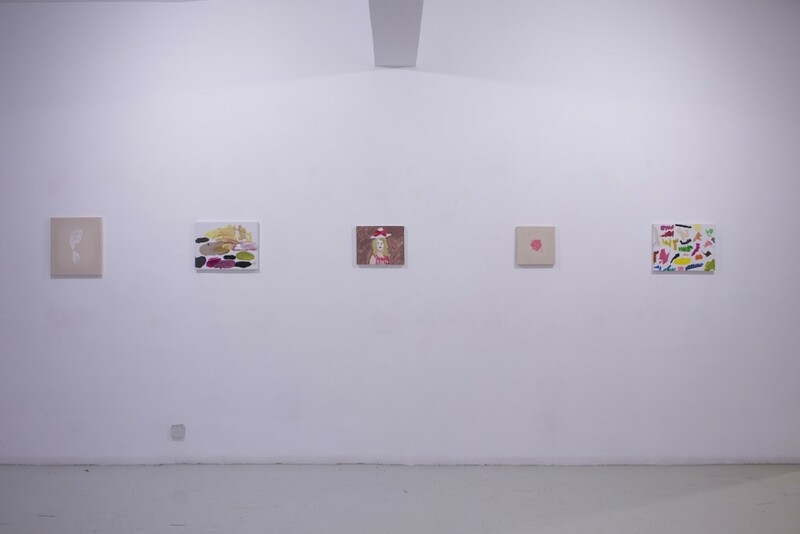 Like Water At A Buffet at Kappatos Gallery runs through May 16, 2015. Kostas Prapoglou is an archaeologist-architect, art writer, critic and curator based in London, UK. 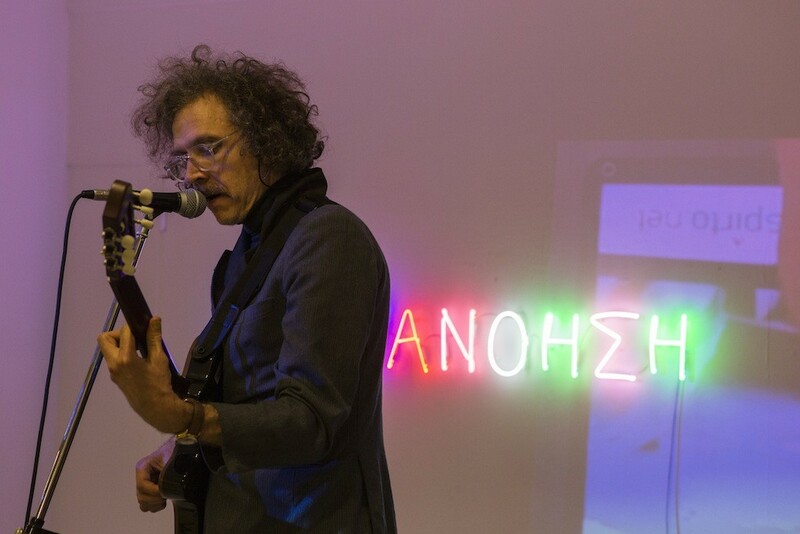 April 28, 2015 | Filed under Art Seen: International and tagged with Kappatos Gallery, Kostas Prapoglou, Martin Creed.